A recently released study showed that nearly all New Year’s resolutions are dropped by February. 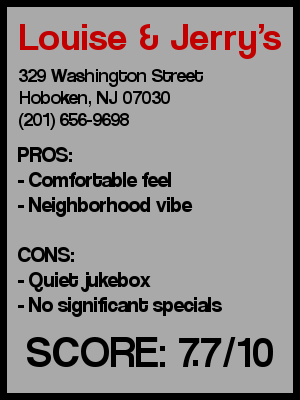 Not only is this New Year’s resolution of going to every bar in Hoboken still going…its picking up the pace. The first place I hit up on a recent weekend was Louise and Jerry’s- a Hoboken fixture for over 50 years. Just a step inside this comfortable bar and you can feel the history around you. Louise and Jerry’s has a below grade entrance, similar to many of the bars that line Manhattan’s St. Mark’s Street. I arrived around 5 o’clock on a Saturday and the place had 20 or so patrons inside. The only seats in the place surround the bar area and a small table or two near the large windows looking out onto Washington Street (These make great for people watching). A large portion of the crowd seemed to be regulars, chatting with the chap behind the bar about the line of succession for the British Throne. They seemed pretty inebriated so that actually seemed interesting to all of them. Overall the crowd was pretty friendly. The bartender, who may have been either a manager or owner, seemed very welcoming and the other patrons we interacted with were all funny and enjoyable. The downside was the way the men’s bathroom smelled, but I think that was more of a factor of who was in there before me as opposed to it being specifically unsanitary. I ordered myself a Blue Moon and a couple of Yuenglings during my time there. They had a pretty traditional draught selection and if they had any specials it might have been written in tiny handwriting on a blackboard but I wasn’t able to read it. The jukebox was very underground garagey ‘60’s-70’s rock with a little rock-punk built in, so the selection might be a little rough for those Justin Bieber fans that read this. The volume was pretty low, which didn’t do the Kiss and Rolling Stones songs justice. And kudos to whoever selected the Blue’s Magoos “(We Ain’t Got) Nothin’ Yet” followed by the Outsiders “Time Won’t Let Me.” I may be the only person my age who has both songs on their iPod, so it was a pleasure to hear these songs outside of my own earbuds. Apparently, based on the decorations on the walls this is a pretty big billiards bar. There are plenty of plaques and pictures hanging of the bar’s pool teams and posters of famous pool scenes from movies on the walls. Also on the walls is a semi-shrine of a lot of the old James Bond actors and a pretty funny and quasi-raunchy cartoon that some patron must have drawn for the bar 20-30 years ago. The back area of the bar has the pool table but isn’t too big so when the place fills up I imagine it is tough to play. There is also a virtual hand shuffleboard game which is something I have never seen before. Since pool seemed to be the thing to do here, myself and the LocalBozo Crew decided to get down on the ol’ eight ball. We played 3 games, in which we probably upset onlookers with our horrendous skill, offended those within earshot of our trash-talking, and almost lost 20 large to some guy named Tex. Luckily there were no injuries nor damage to the table and after we paid our bill we left with some dignity remaining. Preconceived notion – Thought it was going to be a dive bar, but one that I would feel uncomfortable in because I wasn’t a regular. Bar Type – Older dive bar. Crowd stereotype – An older crowd. I was there before dinner on a Saturday night, but everyone was probably 25 and up, with a bunch older than 35. Music – Garage rock on the jukebox…but not loud. Value – I didn’t see any specials and the beers were pretty traditionally priced. Certainly won’t be a cheap night though. Date – Eh, if you know your date would feel comfortable in a dark dive bar it could work, but for the first few dates you probably want to impress them with something else. Hookup – The crowd seemed to look like they were drinkers, so maybe if one of them was single and got really drunk. Seems like you could certainly meet someone here, but I wouldn’t come here if you were on the prowl. Did you know that Hoboken has a record amount of bars in a square mile?